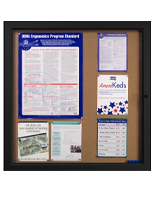 Common Size: 23" x 30"
24.5" x 18.5" 32" x 32" 41" x 42" 42" x 32"
Tackboards, cork boards, and outdoor bulletin boards allow you to display announcements and ours can do it in the great outdoors! 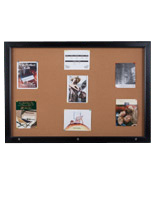 These swing-frame corkboards are designed for exterior mouting to walls and other areas. 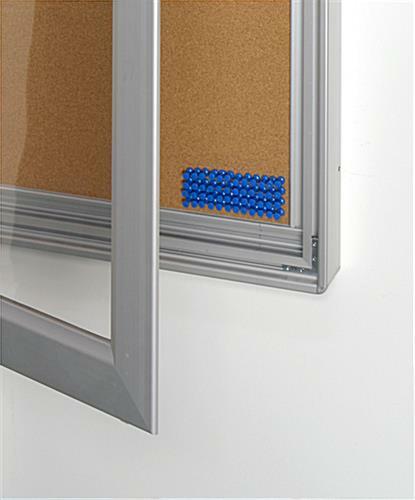 The tackboards' rubber gaskets help to keep out moisture and will hold up fine outdoors. Advertisers can rest assured that the signs will hold up under precipitation. 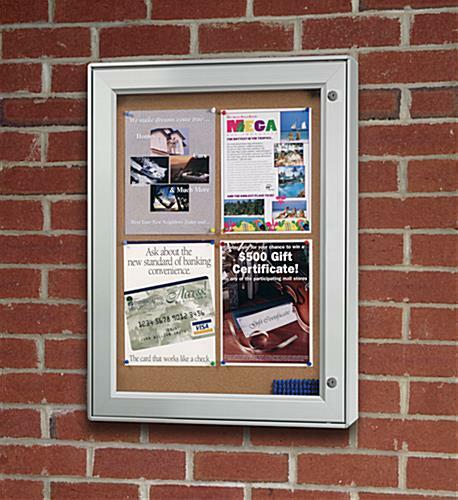 These outdoor tackboards can hold (4) 8 1/2" x 11" pages. 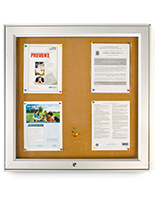 Four standard printer pages fit comforatbly on the corkboard surface. Tackboards are used for announcements or important information. 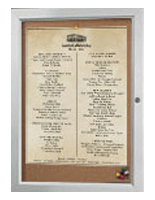 Menus, sales, and upcoming events are just a few of the many signage possibilities. 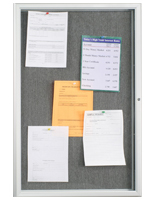 We supply these tackboards and other announcement boards available for you online. 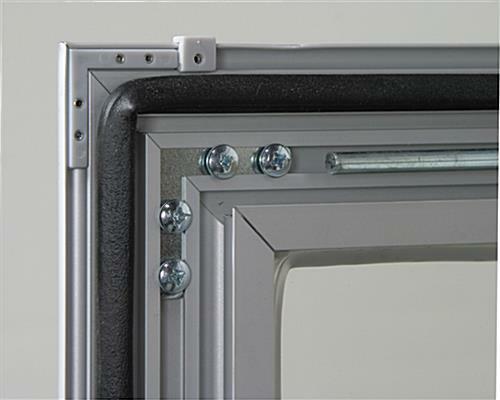 The unit can be mounted 2 different ways; hinges on the right or left, giving you variety when it comes to installation. Quick sign changes are much more feasible with the easy open swing doors. 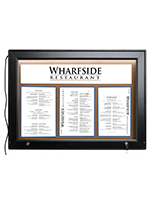 Adorn the cork boards to a wall in either landscape or portrait format depending upon the orientation of the displayed signs. 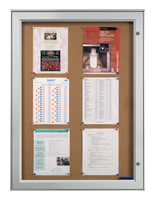 Our tackboards are priced right as compared with other more expensive tackboards and pin boards. 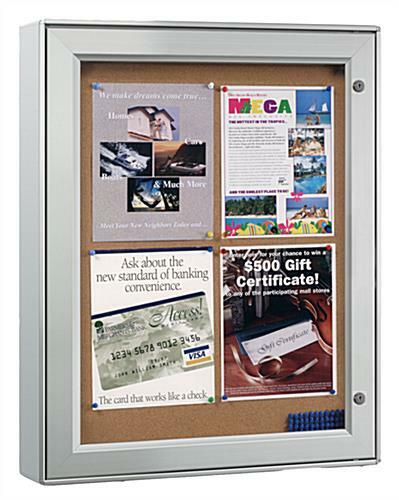 A set of pushpins is also included so advertisers can begin as soon as they receive the unit. 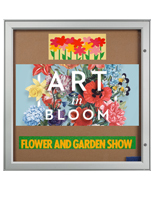 View tackboards online here! 2 Rods keep the door propped open, making it easy to change out information. 23.4" x 30.0" x 2.0"
I have been wanting a outdoor bulletin board. This one had a fairly straightforward installation and is easy to use. I would buy it again. We're so happy to hear this! Thanks for shopping with us! Exactly as advertised! Product well made and exact size needed. Love the shadow box, it was exactly what we were looking for. Even better, the prompt shipping from Displays2Go made our experience even better. Great product, great customer service...we'll be back for sure. We are so glad to hear you'll be shopping with us again, Ken! Thank you for your order and taking the time to let us know about your experience -- we appreciate it!